Put the sugar into a pan, the milk, vanilla and the cream and cook them. Put the gelatin into cold water then cook it into the microwave oven for several seconds then add it into the liquid composition. The mixture is then poured in 3 glasses then put them into the fridge. The jelly - Draw off the pineapple and put the liquid into a glass. Put the sugar into a pan and caramelize it. Then add the syrup and the chopped pineapple. Boil it for 4-5 min. Dip the gelatin in a spoon of water then dissolve it into the microwave oven for several seconds. 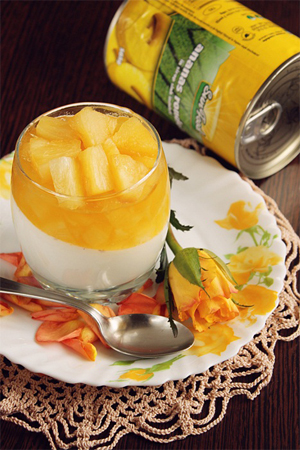 Pour the gelatin into the pineapple syrup, after 1-2 hr, when panna cotta is ready pout the pineapple jelly. Put it back into the fridge until the jelly hardens. Decorate it with the remaining pineapple.